We all have that friend who can often be found with their nose stuck in a good book! And failing that they can often be tracked down to their local bookshop or library, or can even be found browsing for new books online (if, of course, they have forgiven e-book creators for making the epic romance of Pride and Prejudice an app which can be stored next to Tinder on your smart phone). But much as we love our bookworm buddies, they have firmly established themselves as THE nightmare people to buy for, as they have read quite literally everything! And with Christmas fast approaching, the panic is beginning to set in – and let’s face it, yet another novelty (i.e. rude) bookmark is not an option! So to help with this crisis, we’ve come up with some funky gift ideas for bookworms! From floating bookshelves to book-shaped clocks, and from quirky bookends to a lamp which double up as a book rest, these gifts are BOUND to impress! 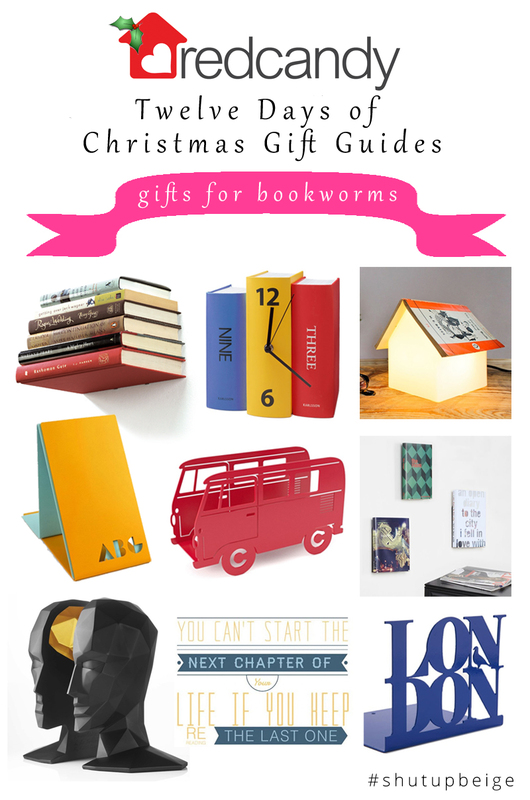 Check out the selection below, or click here to view the whole range of bookworm-y gifts! This simple yet ingenious design is the perfect gift for book lovers! A firm fixture in our best sellers list, the Umbra Conceal Bookshelf creates the powerful illusion of books seemingly floating in piles all up and across your walls. Also levitating books are ideal for Harry Potter fans – Wingardium Leviosa! The Conceal also comes in a set of three and other sizes, see here. Vibrant, bold and fun; this clock would make a perfect present for anyone who can easily get lost in a good book, and could do with an easy way of keeping track of time! 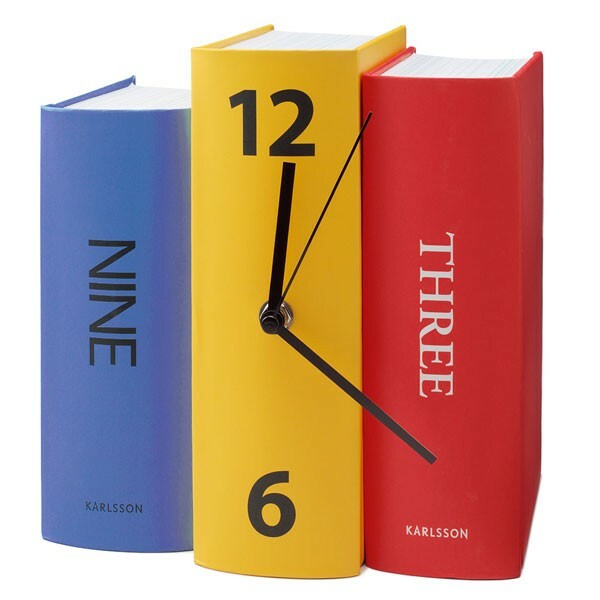 This clock is truly unique: designed to look like three books stood next to each other, with the clock hands bursting out of the middle book. Also comes in Emerald! This vibrant pair of contemporary bookends looks fabulous in any modern space and will add a splash of colour to the room. The set includes two bright bookends, each with stylish cut-outs of the letters ABC. They are both designed like stencils of triangles – with the slanting edge leaning towards the books to keep them upright. Keep your magazines and books tidy and add a retro style icon to your home at the same time, with these funky magazine holders. This fabulous design is perfect for evoking a bit of Sixties charm in your abode, whilst also creating a functional storage solution to keep your pad tidy. This wonderfully inventive design allows bookworms to display their favourite book like a cherished piece of art. This wall mounted book holder will also allow them to get creative with their wall space, whilst keeping your most prized pictorial book candy close to hand. If you’re looking for a luxury statement present for an avid book reader then look no further! These modern head-shaped book ends are a literal representation of the knowledge gained from reading; complete with an inset geometric golden brain design. A great motivational quote as well as an aesthetically pleasing design, this wall sticker is perfect for bookworms. ‘You can’t start the next chapter of your life if you keep re-reading the last one’ is the good advice given by this stylish quote wall decor. Click here to view the whole range of bookworm-y gifts! And remember to look out for our other eleven gift guides – there will be a new one added every working day until 11th December – see what’s coming up here!